I've got a new kind of challenge for today. It's a big book challenge. Sue started it, and thanks to her for the organization of it. The challenge is to read one big book (400 or more pages) during the period from Memorial Day to Labor Day. (For my overseas friends, Memorial Day is the last Monday in May, and Labor Day is the first Monday in September. Memorial Day is sort of the unofficial start of summer, and Labor Day is the unofficial end of summer.) I was immediately interested, and I went to look at my bookshelf. I have a couple of books that would qualify, although a couple of them are rereads. I have just a few that I want to read. And one last thing before I go today. (No, it's not progress pics. Those are coming Sunday or Monday, probably.) I had to go in to the hospital the other day for some tests. My pdoc has me on Adderal (well, the generic for it) to help me wake up, stay awake, and give me more energy. It's sort of working, as it does keep me awake. It's not giving me more energy, but the lessened depression is, so it's all good. Anyways, because of the medication, she wanted me to have an EKG done. She also requested bloodwork. So I took the scripts in to my hospital, whichis about three or four blocks away. I got the tests done (and she asked me to make sure I got them done before she went on maternity leave as her baby gift, since I'm not allowed to give her anything. Stupid rules), and then headed home to get something to eat. I had a small bruise on my arm from the blood test, but not a big deal. Nice to know I DO remember things sometimes, lol. The tech was really nice. She made me feel very comfortable with the whole thing. Anyways, that's my news for today. 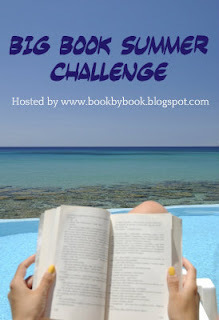 If any of you want to join in the Big Book Challenge, Sue's blog is Book by Book Big Book Summer Challenge. You can still sign up, obviously. Thanks again Sue, for hostessing!!!. Sounds like your prep is going well, and good luck finding some less expensive textbooks. And do get an organizer - I know I'd be lost without mine. I write down everything! So great to read about your happy preparations for going to college. So exciting! School preps are always such fun, haha. I'm loving your Big Book list! ANd isn't preparing for school and buying all the stuff you'll need one of the best things when starting an year? :D I just love buying new notebooks with shiny covers, lol. But textbooks and manuals buying is not that fun. Library is a good option (but our uni library tends to give only books that are like from '86 or older >.> and you can't take the new ones home! ), or you can search for people that just finished these classes and are selling off their textbooks. I've had some like this and sometimes it's kind of cool when all the most important parts of the lesson are underlined and with usefull tips around, lol! You are so right about that, Shaunterria. They're expensive!!!! It has been so far. I love my books, lol. Thanks Cucki, I'm sure I will, all the way through. Thanks Bea. I'm really thinking I will. I'll have quite a few things to keep track of!!! It IS exciting, Kaye. I've been excited for weeks now. I'm wondering if I'll sleep the night before, lol. The problem with that, Rosey, is that I have to give them back and can't write on them. I want to keep my books for later on down the road if I need them. Huh, I hadn't thought of eBay. I'll have to check it out!!! They are sooooooo much fun. I love school too, though. I'm just the opposite, Topcho. I want the ones that are not written in, so I can decide what's important! Thanks for the suggestions though!! Best luck with your school! I'm also in IT industry for the past 15 years of so and have been through all that what you are going to learn. It's not easy to catch up with all the trend in IT area, but it will worth eventually as there is a high demand for the skill. Your investment will go far and beyond once you are all done with your school!! Enjoy the book challenge, i've been spending more time with my nose in a book recently than stitching. Thanks for saying so, Merumo. I'm hoping it will be easy for me. I like to play with my computer, so finding study time shouldn't be an issue. It will be finding stitchy time, lol. I go in fits and spurts, Julie. Some days I read more, some days I stitch more. Just depends on my mood.